Corrosive environments, such as those found in wastewater treatment facilities and industries where processes result in harsh chemical by-products, usually preclude the use of filtered ambient air for forced convection cooling.Corrosives generally cannot be filtered out by normal filtration methods. Scrubbing techniques that must be used to rid air of corrosives are complex, costly and often not satisfactory. For such applications, the cooling method requires isolation of the sensitive components subject to damage from the offending substances. Can you answer these 3 questions correctly? 1. 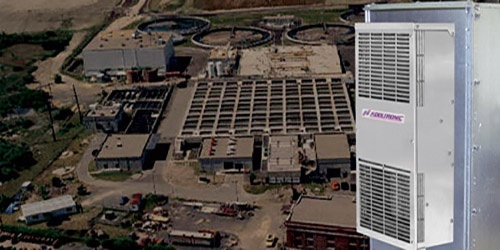 Why is cooling a major concern in wastewater treatment and chemical facilities? A.The reason cooling is of special concern in wastewater treatment and chemical facilities is due to the presence of corrosives in the atmosphere. Corrosive environments, such as those found in chemical plants , wastewater facilities and industries where processes result in harsh chemical by-products, usually preclude the use of filtered ambient air for forced convection cooling. Corrosives generally cannot be filtered out bynormal filtration methods. Scrubbing techniques that must be used to rid air of corrosives are complex, costly and often not satisfactory. For such applications, the cooling method requires isolation of the sensitive components subject to damage from the offending substances. 2. 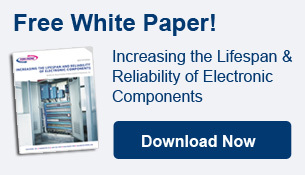 What is the best cooling method or type of unit for corrosive environments? A. In most situations, the best solution is closed-loop cooling, either a heat exchanger or air conditioner, which both consist of two separate circulation systems in a single unit. One system recirculates clean cooling air through the electronics within the sealed enclosure, while the other discharges the heat removed from the cabinet to the ambient air or into water for removal. If the corrosive atmosphere is within an acceptable temperature range, air-to-air heat exchangers can be used to provide cooling for the enclosure. When both high ambient temperatures and corrosives are present, either air conditioners or water-to-air heat exchangers must be employed to cool the components. Regardless of the cooling apparatus chosen, due to the conditions that will be encountered, it must be constructed of appropriate corrosion-resistant materials, or treated with corrosive-resistant coatings, to ensure long, trouble-free operation. 3. What NEMA ratings are advisable in corrosive atmospheres? A. Units rated NEMA 4X provide the best protection for corrosive conditions. In wastewater treatment applications, corrosive chlorine and/or hydrogen sulfide gasses may be present and both are particularly troublesome for exposed copper tubing if left uncoated. NEMA 4X units have stainless steel shells and the proper coil protection for this environment, which applies to both air conditioners and heat exchangers. These cooling units are closed-loop to keep containments from getting inside the enclosure. The main factor in determining whether to use an air conditioner or heat exchanger is the temperature that must be maintained within the enclosure. A heat exchanger will keep the internal cabinet temperature at or above ambient, while an air conditioner can bring the temperature down below ambient. The actual performance varies with the cooling capacity of the unit selected; therefore, a sizing guide may be helpful in determining which cooling system is best for a particular application. Additionally, it is important to review all of the conditions involved, as a system can typically be designed to meet specific requirements as necessary.